Growing at a fast rate, the Kieffer pear tree produces fruit in late September in USDA hardiness zones 4 through 9. It's very hardy and can tolerate hot environments. Planters should harvest this pear tree from the middle of September to the middle of October. As a hybrid between a European and Chinese sand pear, the oval-shaped Kieffer pear tree grows large, yellow fruit with a crisp, juicy and coarse-like white flesh. The Kieffer pear tree grows white flowers with glossy leaves that alternate on the branches. These leaves also have fine teeth on their edges and turn a golden bronze during the fall season. The Kieffer pear tree shoots upward from 15 to 30 feet and spreads to as much as 20 feet wide when fully mature. Requiring more than six hours of consistent and direct sunlight per day, the Kieffer pear tree does best when adequately watered but will still tolerate flooding and drought. The Kieffer pear tree grows best in deep, moist and slightly acidic soil with good drainage. Other soils can be used but will turn out a lighter crop. 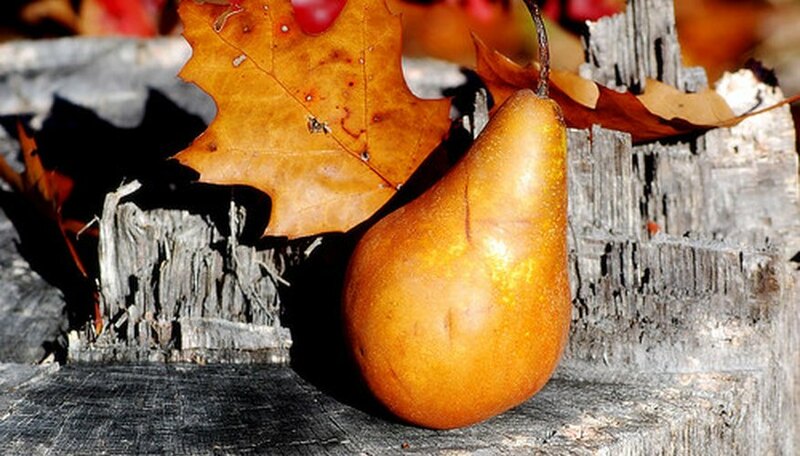 People use the fruit from the Kieffer pear tree in preserves, baking, honey and canning.